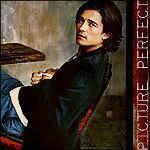 Hollywood star Orlando Bloom is paying a visit to the Donetsk region. He is meeting with children in Sloviansk, Kramatorsk and Sviatohirsk. These cities have been freed from the Russian-backed separatist forces. The official goal of Bloom's visit is currently unknown. His arrival has been kept secret. But fans have uploaded photos with the star to the Internet. According to the local media outlets, Bloom has arrived in eastern Ukraine as a UNICEF Goodwill ambassador. The star of "The lord of the rings" and "The Pirates of the Caribbean" movies is reportedly staying in Ukraine for the week. Oh wow! I am so proud of Orlando for wanting to help these special children in the Ukraine. I had a feeling he would be going somewhere with UNICEF soon so I was right. 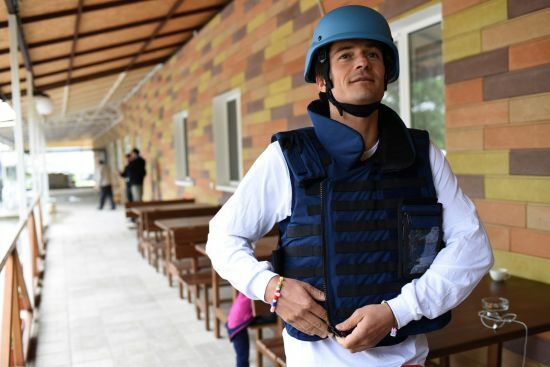 Kudos to Orlando for visiting the children of Eastern Ukraine as a UNICEF Goodwill Ambassador. God bless the man for giving of his time, talents and energy to help all children in need. Thanks, Rene, for providing the info. Such a compassionate and brave man. Ukraine's east is not an easy place to be right now. All the more important to help the people there! Thank you, Orlando. NEW YORK/ KYIV, 4 May 2016 – UNICEF Goodwill Ambassador Orlando Bloom travelled to conflict-hit eastern Ukraine to raise awareness of the global education crisis facing children in humanitarian emergencies. Bloom visited classrooms hit by shells just three kilometres from the frontline of the conflict that broke out more than two years ago. Approximately 580,000 children are in urgent need of aid and more than 230,000 children have been forced from their homes. Around one in five schools and kindergartens in the region have been damaged or destroyed and around 300,000 children are in immediate need of assistance to continue their education. The trip came as new findings show that nearly a quarter of the world’s school-aged children – 462 million – now live in countries affected by crisis. Education Cannot Wait - proposing a fund for education in emergencies, written by the Overseas Development Institute and commissioned by a range of partners including UNICEF, reveals that nearly one in six – or 75 million – children from pre-primary to upper-secondary age (3-18) living in nations affected by crises is classed as being in desperate need of educational support. However, on average, only two per cent of global humanitarian appeals are dedicated to education. At the very first World Humanitarian Summit in Istanbul in less than three weeks’ time, a groundbreaking new fund - Education Cannot Wait - will be launched to give access to learning to every child in need in emergencies. It aims to raise nearly $4 billion to reach 13.6 million children in need of education in emergencies within 5 years, before reaching 75 million children by 2030. In eastern Ukraine, and in emergencies across the world, UNICEF is working around the clock to get children back to learning – to keep them safe and secure their futures. UNICEF so far has supported the repair and rehabilitation of 57 schools in eastern Ukraine and has supplied hundreds of thousands of children with vital supplies like schoolbooks, desks and pencils, as well as psychological support and catch-up classes. UNICEF has also reached nearly 280,000 children with information on the risks posed by land mines and unexploded ordnance, which litter communities near the frontline. During his time in eastern Ukraine, Bloom also met with schoolchildren who are receiving counselling from UNICEF-supported psychologists, to help them recover from their distressing experiences during the conflict. Across the world, more than 37 million primary and lower secondary children are out of school and educational facilities are continually forced to close as a consequence of conflicts and of natural disasters – putting millions more at risk. In Syria alone more than 6000 schools are out of use – attacked, occupied by the military or taken over as an emergency shelter. In North-East Nigeria and Cameroon more than 1,800 schools have been shut due to the crisis and in conflict-hit Central African Republic a quarter of schools are not functioning. UNICEF promotes the rights and wellbeing of every child, in everything we do. Together with our partners, we work in 190 countries and territories to translate that commitment into practical action, focusing special effort on reaching the most vulnerable and excluded children, to the benefit of all children, everywhere. For more information about UNICEF and its work visit: www.unicef.org. A new UNICEF report shows that almost a quarter of the world’s children live in countries affected by crisis. “How could anybody do this to children?” Those are the words of a kindergarten principal, Lena Antonenko, whom I met in a town called Myronivskyi, near the frontline of the conflict in eastern Ukraine. When the shelling began last year, she took shelter in the basement of the building with a group of terrified children and other teachers. The kids were no older than 5—the same age as my own son. They cowered in the dark on tiny white benches made for toddlers, with no electricity, no running water and nowhere to go to the toilet. Suddenly there were two catastrophically loud bangs. Teachers and children emerged to find walls collapsed, every single window blown out and rubble waist-high in some rooms. This was a kindergarten. The children were obviously hysterical. It is no exaggeration to say that they will never be the same again. In eastern Ukraine, about one in five schools and kindergartens have been damaged or destroyed in a conflict that has been going on for more than two years now. It seems to be largely forgotten internationally, but about 580,000 children are in urgent need of aid, and 300,000 children need help to continue their education. There are schools still in need of repair. Children need basic educational supplies like pens, books, schoolbags and desks. They also need emotional support to help them cope with the terrifying experiences they have lived through, as well as a chance just to play without being afraid. They deserve a chance to be children again. Sadly, this situation is all too common around the world. New figures show that nearly a quarter of the world’s school-aged children—that’s 462 million kids—now live in countries affected by crisis. About 75 million of them are in desperate need of educational support. If an entire generation grows up in crisis, without access to the education they need, what does that mean for their communities? For their countries? Children who are out of school can find themselves in terrible danger. They are easier targets of abuse, exploitation and recruitment by armed forces and groups. They also are not given a chance to access learning that can help them find what they love in life and build a peaceful future for themselves and the people around them. We have to do better. It’s clear that education can change lives in a disaster. Going to school keeps children safe and gives them a vital routine—just what they need in a time of huge upheaval. UNICEF is doing whatever it takes to get children in humanitarian emergencies back to learning—whether it be by giving children learning supplies, repairing destroyed schools or by training teachers to counsel children through this conflict. But with only an average of 2% of humanitarian appeals being devoted to education—there’s still so much to be done. Thankfully, there is work going on to change this. A new fund is being launched in just three weeks’ time at the very first World Humanitarian Summit in Turkey: Education Cannot Wait. The aim is to give millions of children living in emergencies access to education. The statistics are mind-blowing! Thank you, Orlando, UNICEF, and all those who care about the young and vulnerable, and their needs. I am happy to learn about the Education Cannot Wait summit in Turkey. Truly it cannot -- the alternative is the loss of a generation, or so it would seem. Rene, thanks for posting the various links and the photos. Barbara, I agree with every thing you said here and I couldn't have said better if tried. I am all emotional after reading the articles and seeing the wonderful pictures of Orlando with these sweet, beautiful children that have endured so much. Thank you so much Rene for posting the pictures, the video links and the articles to Orlando for wanting to help these special children. Powerful message from Orlando. Thanks, Rene, for providing this video. Orlando's visit to the Ukraine has really opened my eyes to what these children are going through. I also can see just how much he cares. Thank you so much Rene for posting this video. Thanks for posting all these photos and videos, Rene. I always find the UNICEF site a little confusing. Watching the videos brought tears to my eyes. Watching Orlando put on the flak jacket made me feel a little ill, but he is so loving and giving. And all those precious children and their teachers: I hope UNICEF can help them. 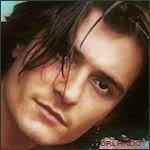 Editor's Note: Orlando Bloom is an English film and stage actor. He was appointed a UNICEF Goodwill Ambassador in October 2009. He recently traveled to conflict-torn eastern Ukraine, where UNICEF says an estimated 580,000 children are in urgent need of aid. The views expressed are his own. (CNN) - April 27, 2016: We wake up early and travel by car for three hours from Kharkiv, a city in eastern Ukraine, toward the zone worst affected by the conflict in the country. Miles of black, fertile farmland stretch long and flat outside the window, framed by vivid green grass and puffs of trees. It is difficult to imagine that we could be approaching a conflict zone. We arrive at School 13 in Slavyansk, one of the first schools to be hit during the fighting. One quiet spring day, a shell crashed into the roof of the school theater. A generation of children who had never known fighting were suddenly under fire. In shock, they ran screaming into the school basement, where teachers attempted to calm them. I can't imagine what I would have done in their place -- one minute you are sitting in class on a normal school day, the next the world is falling down around you. It is clear that, nearly two years on, the conflict is far from over. Around 580,000 children are in desperate need of aid, while about 300,000 need support to continue their education. Around one-in-five schools and kindergartens is damaged or destroyed. The neighboring areas, like here in Slavyansk, are flooded with children who have fled the active conflict zone -- more than 230,000 have been forced from their homes in total. Every child has been through a terrible experience -- they have witnessed explosions and destruction, they have lost their homes, some of them have lost family -- all have lost their routines. One of them is 9-year-old Gleb, who told me what happened to him when his school was hit at the height of the fighting. As a father of a 5-year-old boy myself, it is hard to hear what he went through. "My friends and I were going to get ice cream when a shell flew over our heads," he told me. "I heard 'boom, boom' and that was the shell that hit our school. A second shell exploded over our heads and we saw the bits and pieces falling on the ground all around us." Gleb ran home to his mother and took shelter in the basement. "Everyone was hiding in bomb shelters in basements," he tells me. All of my friends left. My mother and I went to another city as soon as we could to get away from the fighting." What does an experience like that do to a child? No one should ever have to live through this. In the panic of conflict, people think of the basics: Get to cover as fast as you can; save your life. But recovery is a more complex picture. When conflict hit this area, one of UNICEF's first priorities was to help get children back to learning. After all, experience shows that education is critical in times of emergencies, and it should be part of a basic humanitarian response -- alongside providing food, water and shelter. When you read the statistics, it is easy to understand why. Nearly a quarter of the world's school-aged children -- 462 million -- live in countries affected by crisis. An estimated 37 million children between the ages of 6 and 15 in crisis-hit countries are out of school. In this situation, outside a safe and supportive learning environment, children can find themselves in terrible danger: targets of abuse, exploitation and recruitment by armed forces and groups. They are also missing the opportunity to learn and play: to be children. At School 13 in Slavyansk, UNICEF has helped refurbish the building and has provided new furniture, like desks and cupboards, to make sure classrooms are functioning. But it's not just about four walls, schoolbags, books and pens. Giving children the chance to learn during traumatic experiences is also being prioritized. It is imperative for children's recovery. In this school, Lego blocks are now provided in most of the classrooms, while table tennis tables are set up in the halls for use during breaks. Next we travel to Svyatogorsk Community Support Center. Two years ago there were 3,500 people in this town of one school and one kindergarten. As the conflict intensified, suddenly it swelled to more than 10,000. More than 40 children come on daily, and most of the staff are displaced themselves. Being forced from your home, losing everything, is hard enough. Add in moving to a new town and to a new school, amid the tensions of conflict, and you have a mix that would be too much to bear for anyone, especially children. In Svyatogorsk, schools started to run double shifts -- one for local children, another for the newcomers. I was told something needed to be done to encourage integration. They started to mix up classes in the schools. And the center for displaced children opened its doors, starting to function as a community center where everyone is welcome -- newcomers and long-term residents. Two communities slowly began to become one. Our final stop of the day is the most challenging. Families who have endured terrible experiences during the conflict -- losing family members, homes, witnessing unspeakable violence -- come here to the Promir Centre for Psychotherapeutic support in Slovyansk, which is also backed by UNICEF. I'm told there is not a culture of using psychologists in this part of the world, so for some families it is difficult to even come through the doors. However, the center focuses much of its efforts on outreach and today about 10 children are gathered around a sandpit with a child psychologist, drawing shapes in the sand and talking through their hopes and dreams as well as their insecurities and fears. One of them is 8-year-old Maxim. He left Kirovsk in Luhansk nearly two years ago, when his dad was killed by a sniper. He arrived in Slovyansk with his two brothers and his mother, who was in a desperate state. "I couldn't stop crying -- I was beside myself," his mother, Ludmila, says. "My child saw everything and heard everything. There was a machine that shot mortars stationed right next to our house. There were shells being fired above our house." As soon as she heard about the center, she arranged therapy sessions for herself and for her sons. "Maxim was really scared of the darkness. He couldn't even go to the toilet alone. He has been working here with a psychologist to draw his fears, as a way to get rid of them." Maxim is quiet, but now plays happily in the sand with other children and comes for regular sessions. He smiles shyly and tells me one of the best things about him is his good behavior. His mum agrees. The center feels warm, friendly and inviting. Today, armored vehicles are waiting for us. We are going deeper into the conflict zone, to see the impact on children's education at the front line. Our security team shows us how to put on flak jackets and helmets. They are uncomfortable -- heavy and hot. We pack the jackets around our bodies in the car, ready to put them on at any sign of trouble. I don't really know what to expect. Why are children going to school in a place where I have to travel in armored cars and with bulletproof clothing? There is very little traffic on the scarred road, which is filled with potholes. We have been warned not to leave the vehicle under any circumstance. The fields to either side are littered with landmines and unexploded ordinances. From time to time we see well-kept trenches slice through the land. We face checkpoint after checkpoint. Soldiers padded with camouflage and carrying guns approach the vehicles. At one point a tank stands to the side of the road. At the last checkpoint, we are warned we must turn left, toward the community of Myronivskyi, otherwise we'll drive straight into the middle of the front line. The town feels empty. Grey buildings stretch up from the street. Some are semi-demolished, eaten by shells. Two women clutching grocery bags cross in front of us. Where have they come from and where are they going? I am standing by the entrance of School No 2 in Myronivskyi, reading a sign painted in black on the door -- "bomb shelter" -- when we hear a distant explosion. "Outgoing!" our security adviser calls. I am escorted inside. It is surreal and shocking. I wasn't expecting to actually have to find cover myself. But I am here meeting children who have had to take much more serious precautions, for a much longer time. I can't comprehend how frightened they must have been. Liana, 11, is the daughter of the school janitor. She stayed in the basement for almost two weeks with her mother and father, sheltering from shell attacks. She is very quiet. She still looks afraid. "It was so scary," she tells me. She leads me to a back staircase in the school and down the stairs to the basement. A door-frame leads into a tiny room, filled with makeshift beds. A half spent candle sits on a chair. She points out the bed where she slept for nearly two weeks last winter. It is still there, with a blanket pulled over the mattress, just in case. It's cold down here. The walls are crumbling. There is no proper toilet. There was only electricity for the first few days of Liana's stay here. Then there was nothing -- no heating, no light, no running water, in the depths of winter. They heard shell after shell explode in their hometown, not knowing when it would end. I wouldn't want to spend one night in these conditions, let alone imagine my own child being exposed to them. Kids are deeply affected by the conflict in ways they often have not yet processed for themselves. Back upstairs, in a classroom, I met 7-year-old Artem who is full of energy. The pages of his drawing book are filled with military images -- guns, soldiers, tanks. He envisions himself as a superhero. When he grows up he wants to be a ninja -- a golden ninja at that -- to keep his family safe from the bad guys. "How could anybody do this to children?" That's what the director of kindergarten Veselka, Elena Antonenko, says out loud as she shows me the building -- rebuilt, but almost destroyed in shelling last year. Little ones, no more than 5 years old, were sheltering in the basement when a shell directly struck the building and another a hospital nearby. The double impact was catastrophic. Whole walls collapsed. Every single window was blown out. The teachers emerged to find waist-high rubble in some rooms. They have rebuilt, and are trying to recover. Lena keeps a small box of the shrapnel that littered the floor and was embedded in the walls. She clutches a book of photographs, showing the initial damage. In the basement there are tiny white benches made for toddlers placed in a circle, just in case of another attack. "These children will never be the same again, not after what they have been through," she says. "We are always listening to the sky. Now we are more afraid than ever as we know life can be over in a second. We owe these children. We owe these children for the rest of their lives for what they have gone through." I climb back into the armored vehicle, feeling that I couldn't agree more. Before we leave, we visit a nearby center for children's creativity in Svitlodarsk that specializes in informal education. Some children who come here stayed in the area all through the intense shelling of last January. I visited an art class, met drama students and stopped by the beauty salon, where children are learning new skills and experimenting with their creative flair. That's a need that I can relate to, and surely it's all the more important when you have to deal with the constant stress of conflict. You see how crucial it is for children to have access to education -- to keep up some kind of normality and to have the opportunity to build a future for themselves, their families and contribute to their communities. But sometimes education is just not given the priority it deserves. On average only 2% of humanitarian appeals is allocated to education. With that reality in mind, at the very first World Humanitarian Summit in just three weeks' time, a brand new global fund -- Education Cannot Wait -- will be launched to help provide children affected by emergencies get access to education. Having witnessed the tremendous need on the ground, and the life-changing effect of education, I can't think of anything more important than that. Children don't choose to be affected by conflict and natural disasters. The least we can do is offer them the chance to build a brighter, peaceful future. I am so emotional right now after reading Orlando's report. I can't imagine what it must been like for those children, their families and the community to go through all this. I also didn't realize how close Orlando got to the fighting while he was there, that must have been unnerving for him. After reading this I know how lucky and fortunate we are to be living where we are when I think of what these children are facing every day. I am definitely not going to complain about anything again. Thank you so much Rene for posting Orlando's report and to Orlando for caring about these special children and raising awareness of what they are enduring. I cannot fathom what these children have endured and continue to endure. Thank you, Orlando, for providing such an eye-opening report, and for being a spokesperson for these displaced and hurting young ones. Rene, thank you for posting Orlando's report. No child should have to go through what these young ones have had thrust upon them. The Education Cannot Wait initiative will hopefully provide a brighter future for all children whose education and very lives have been compromised.